Removable hood for weather protection. Multiple zippered external pockets and internal pockets to hold gear. Shell Material: 85% polyamide/ 15% spandex fabric. Lining Material: 100% polyester lining. Inner elastic wrist gaiter with thumbhole. This Bogner Sassy D is brand new with tags. It is a size 6. Off white with the fur hood. Please feel free to contact me with any questions. I bought it for my wife for Christmas from a European website. They sent the wrong size. It cost too much to mail back. My other user ID is "notjustparts4u". Very Good Conditions - Minimal Wear. Bogner Fire Ice Zoe Pullover Rain Jacket - Zip Neck. Care: Machine wash, DO NOT tumble dry. Full zip-front closure with "B" toggle. exterior is 100% polyester faux suede. This is a warm, elegant faux-suede/faux-fur-lined jacket/coat with lovely lines fromBOGNER Fire Ice ! "FIRE ICE" embroidered logo on left cuff. Breathable, insulated, waterproof, windproof. Developed for skiing, ski touring, snowboarding, urban outdoor in cold, rain, wind, snowy conditions. Modern Fit with stand-up collar with integrated drawstring hood. Loaded with B zip pull tabs. A classic hip hop ski jacket. Great for cold outdoor activities. Stay warm in the Winter and Spring in style! From center back of collar to bottom- 35". Total luxury! Type: Flinn. Goose Down. Size: EU 52 / US 42 L (Slim Fit, armpit to armpit is 24"). Waterproof - 20,000. Down Fill Power: 750. Removable Hood. Pass Pocket. Insulation Type: Down. Bogner Pian Ski Jacket Coat Mens Large 50 EU. Excellent condition. Originally $2,000. Very hard to find. Purchased in Courchevel in 2018. A few small marks probably needs a dry clean but nothing too bad. No rips or damage. Feel free to ask any questions! BOGNER JACKET. - Coat fastens down front with zipper closure. - Jacket is lightly worn, has plenty of life left in it. All my sales are FINAL SALE. I am here to work with you! - USA Size 6. I am always open to talking and finding a resolution. Padding:80% Down,20% Feather. The hood is detachable. Size M (armpit to armpit-48 cm). Bogner Fire and Ice Men’s Ski / Winter Jacket. Pre-owned but in excellent condition. Clean, no stains, tears, or rips. All zippers work on all inside and outside pockets. Detachable hood. FIRE ICE MEN’S COLLECTION Philip coat size 40 Original price with sales tax $800 New with tags black and granite Perfect Apres ski coat. Technical meets super chic wool with inner removable quilted down vest and snow/rain proofed this inner sleeves. All out and on to new adventures! Conquer the slopes with the new FIRE ICE Collection and a Capsule Collection all in black. Find your style with a casual fit and ultimate freedom of movement. Bogner Woman Blue Hooded Zip Up Ligth Jacket Si ze S. Hip 34-36”. Length 24.5”. C he st 36”. Padding: 80% Down, 20% Feather. Detachable Hood. Outer Shell: 100% Polyester. Lining: 100% Polyester. 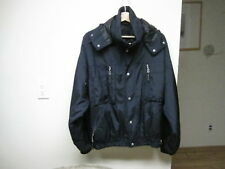 Used Once Polyester shell jacket.